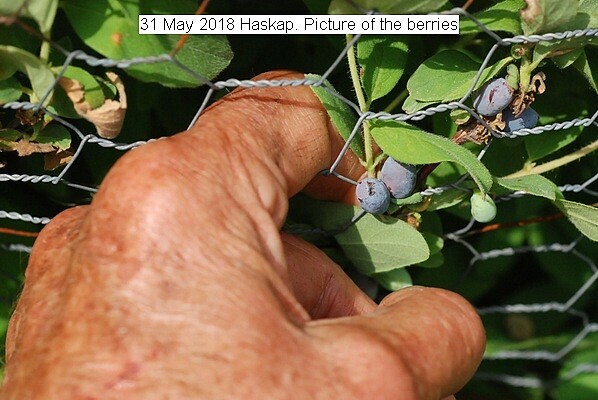 I have six haskap bushes fenced in my garden. Birds love them particularly robins. They grow well and produce a fruit similar in appearance to blueberry. They are sour but do make nice smoothies and being the first summer berry are most welcome. Each berry must be individually picked no clump pulling. Great case for slavery. Bird protection is essential or I get zero berries. I use chicken wire and fiber glass cloth for the tops. Bird netting must not harm or trap the birds. This entry was posted in Uncategorized and tagged 31 May 2018 Haskap, 31 May 2018 Haskap (Lonicera caerulea), Haskap (Lonicera caerulea). Bookmark the permalink.